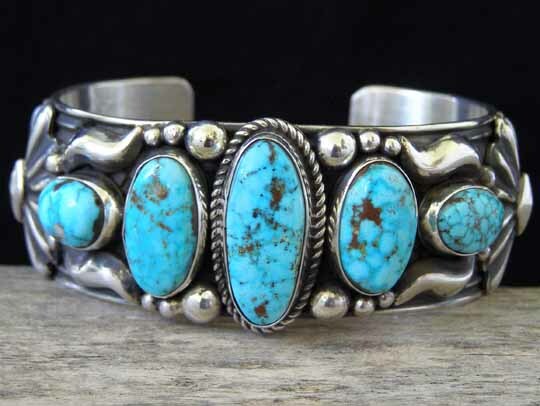 Albert Jake Kingman Turquoise Graduated RowBracelet size 6 3/8"
This five-stone graduated row bracelet features stones of natural, untreated Kingman turquoise from Arizona. This uniform-width cuff has a rich wrap of stones. Heavily textured oval conchas frame this set of stones while groups of raindrops are interspersed between the stones to add dazzle. Traditional stampwork decorates the bracelet to the terminals. Stones: center 15/16" x 3/8"; left 3/4" x 3/8"; right 11/16" x 7/16"; far left 7/16" x 3/8"; far right 1/2" x 5/16"